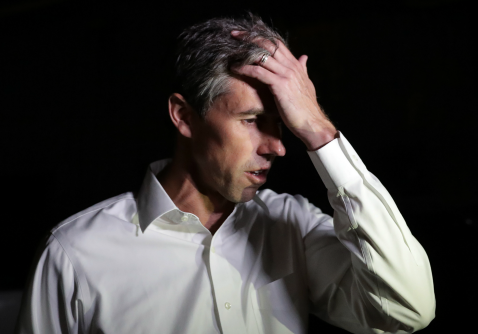 The Washington Post‘s fact checker gave Democratic presidential candidate Beto O'Rourke a "Three Pinocchios" rating for claiming the United States been involved in Iraq for "27-years." O'Rourke has repeatedly denounced America's "endless wars" since announcing his campaign for president last month. The "political math" utilized by the Texas Democrat to measure the length of those wars, however, caught the Post's attention as inaccurate. "And then if we really mean it, if we really mean it, we will ensure that this country does not start yet another war before every peaceful, diplomatic, nonviolent alternative is explored and pursued," O'Rourke told an audience in El Paso, Texas on March 30. "And those wars that we ask our fellow Americans, these service members to fight on our behalf, 17 years and counting in Afghanistan, 27 years and counting in Iraq, let's bring these wars to a close and bring these service members back home to their families, to their communities and to their country." O'Rourke repeated the claim only days later while campaigning in Iowa. "Do we really want to fight wars forever?" O'Rourke asked an audience on April 3. "Twenty-seven years in Iraq, 18 years, almost, in Afghanistan and counting with no definition or strategy or end in sight. Trillions of dollars we are spending to fight and to rebuild countries that we've invaded." "Given what others are already sacrificing in this country, men and women who are deployed right now in wars that have gone for 17, 27 years in Afghanistan and Iraq," he told another crowd in Storm Lake, Iowa on April 4. The Post wrote that it was "flummoxed" by O'Rourke's claims, especially since there are "three, or maybe four, points at which the U.S. can be labeled as fighting in Iraq in the past three decades." Running through an analysis of U.S. intervention dating back to the Gulf War (1990-1991) to the invasion of Iraq in 2003 and the subsequent aftermath, the Post determined there was little credibility to O'Rourke's claim of "a continuous war." O’Rourke may have a case that the United States has embarked on costly military adventures without exploring enough alternatives. But the critique concerning Iraq does not extend back 27 years. Given the number of times O’Rourke has said this, it's no slip of the tongue. But it's also mostly false. This entry was posted in Politics and tagged Beto O'Rourke, The Washington Post. Bookmark the permalink.